Homeowner Education: Anatomy of a Roof - All Storm Solutions Inc.
On our 2nd edition of our homeowner education series we are touching on the anatomy of your home’s roof. In Homeowner Education: Anatomy of a Roof we will take a look at some of the basic components of a roof as well as take a look at some diagrams & learning resources so you are informed and prepared in the future. The part of of your roof that everyone sees and that protects your home are the shingles, a small thin piece of building material often with one end thicker than the other for laying in overlapping rows as a covering for the roof or sides of a building, most typically the material being used is a asphalt composition but can range from metal to even solar panels. The list of above may seem a little overwhelming but taking some time to take it in and most importantly, looking at your own roof’s anatomy afterwards will massively aid in your learning process. Looking at your own roof will help understand what location specific problems you need to focus on or examine. 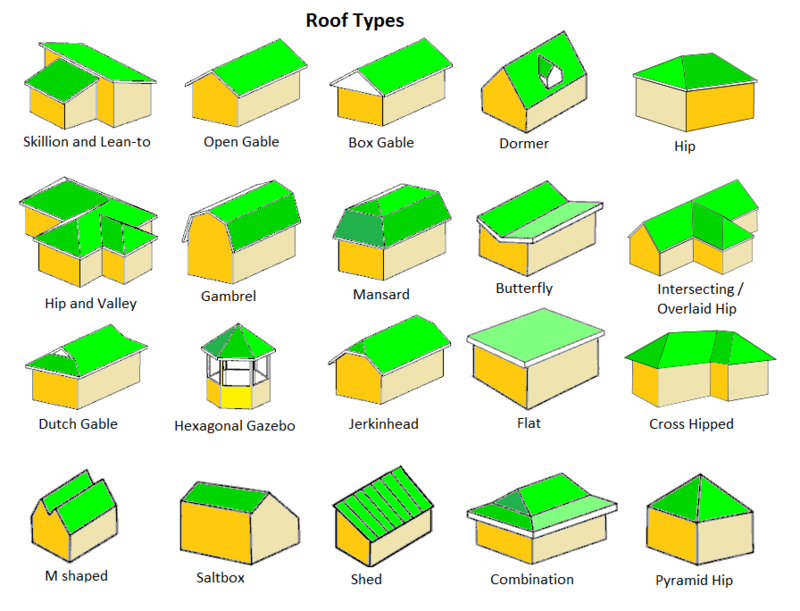 The image below shows the different styles of residential roofs that you may have on your home – your home may be a bit different but this is a great jumping off point. It is important no matter what type of roof you have or what shapes it has the same important elements of performance need to be present. Generally speaking there needs to be a support/base (decking), followed by moisture resistant layers (Ice & Water Shield), finished off with the shingles being installed on top along with any ventilation needed. Each roof is different in what it requires but the basic elements of support, moisture protection, shingles and ventilation need to be there in each case. If you want to go the extra mile in educating yourself as a homeowner, you can take a quick quiz that takes no more than a few minutes. Check out Quizlet.com and the Roofing Quiz that someone has put together on all the major components of your roof’s anatomy. Simply click through the terms, try and correctly answer as many terms as you come across, and if you’re done/stuck just click on the electronic flashcard to see an image and definition of the term. At the end of the day All Storm Solutions is here to help you as the homeowner understand your roof and it’s issues and to make sure you know why/how things are being fixed to make you more aware and knowledgeable. Our Solution Specialists have years of experience in which they have encountered many different unique roofs and what’s left of one sometimes. We are here to work with you until the very end of all repairs and make sure they are done 100% correctly, safely, and efficiently. Pingback:	Homeowner Education: Different Types of Shingles - All Storm Solutions Inc.